The Federal Court of Appeal has overturned the federal government’s approval of the Trans Mountain expansion project, sending it back to the National Energy Board for further environmental assessment. In a unanimous decision released Thursday, the three-member panel said the Liberal government failed to adequately consult First Nations whose rights are impacted by the pipeline expansion, while the National Energy Board failed to properly consider increased tanker traffic that would result. The ruling means construction on the project must once again be halted while the matter returns to the regulator for further review, and then for additional consultations between the government and First Nations. On the duty to consult, “Canada’s efforts fell well short of the mark set by the Supreme Court of Canada,” Madame Justice Eleanor Dawson wrote. However, the court said Ottawa could revive the project by addressing the shortcomings noted in the decision. In Calgary, Kinder Morgan Canada’s shareholders on Thursday voted overwhelmingly to approve the sale of the pipeline and expansion project. Steve Kean, the company’s chairman and chief executive, said 99 per cent-plus of every class of shareholders voted in favour of the transaction. Shares of Canadian energy companies fell in midday trading on the Toronto Stock Exchange. The Toronto Stock Exchange energy subindex was off nearly 2 per cent. Oil sands producers with exposure to the expansion project were big losers, including MEG Energy Corp. (down 7.8 per cent), Cenovus Energy Inc. (down 5 per cent), and Athabasca Oil Corp (down 5.7 per cent). One industry group expressed ‘dismay” at the decision, noting that, at best, it will delay completion of the project for an undetermined amount of time. “Canada’s major resource project approval process is close to collapse under the weight of too many conflicting interests,” the Calgary-based Explorers and Producers Association of Canada said in a release. Producers argue the delay will have repercussions across the economy. “After years of exhaustive review, any further delays to this important project will only serve to harm the Canadian economy by limiting access to global markets for the country’s oil exports and depriving governments of additional tax and royalty revenues,” said Al Reid, executive vice-president at Cenovus Energy Inc., one of the country’s largest oil producers. Kinder Morgan suspended work on the project in April, citing political and legal uncertainty that threatened its financial viability. 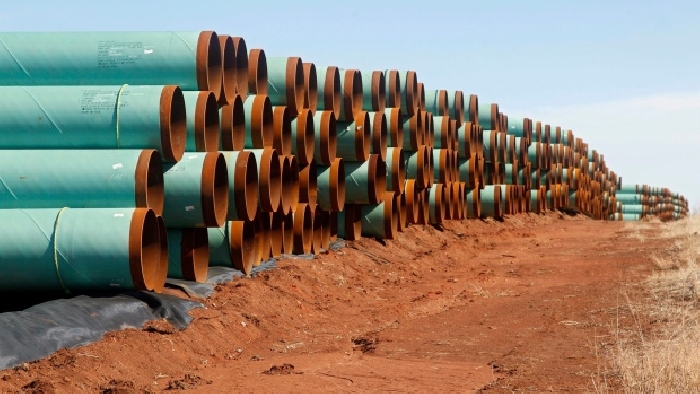 In order to move it forward, Ottawa agreed to purchase the pipeline and finance construction, with the expectation it could sell it back to private-sector operators once construction nears completion. The ruling represents a major setback for Prime Minister Justin Trudeau and Alberta Premier Rachel Notley, who have committed to see the project completed in order to provide access to new Asia-Pacific markets and world prices for western Canadian oil industry. Producers are already facing pipeline constraints in getting their oil to markets and often have to accept steep discounts on their supply. The Liberal cabinet approved the Trans Mountain expansion in November 2016, after the NEB declared it would have minimal environmental impact. The court also found the National Energy Board erred when it decided that, as part of its mandate, it was not required to review the increased marine traffic in British Columbia waters that would result from the pipeline expansion. Meanwhile, the town and RM of Moosomin have proposed reconsidering the cancelled Energy East Pipeline project, which would carry oil from Western Canada to Eastern Canadian refineries.